Painting came to me by way of weaving. As a tapestry weaver from 1982-1997, I feel I learned to ‘paint with wool’ and in 1998 I switched to painting full-time. I am primarily a landscape painter, working in oils but also enjoy figurative work and still life. Living in rural New Hampshire, I’m surrounded and influenced by the rugged and ever changing landscape around me. I travel frequently to different parts of New England and enjoy hiking, biking, boating, skiing, snowshoeing and any other activities that get me outside. My love of nature and the outdoors, and the constant variety in color, texture and atmosphere that is prevalent here in New England, are a constant source of inspiration for my work. 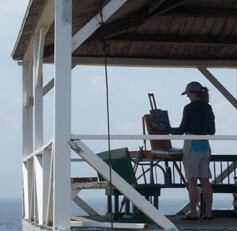 Paintings often begin with a plein air study, which later becomes a large painting in the studio. Photographs serve to reawaken a memory of a particular moment in time and may inspire a new piece. Paintings can develop from a very small ‘moment’ taken from a larger scene or simply from the colors, atmosphere and/or a feeling evoked that just strikes a chord in my mind. I hope you enjoy looking at my work! Please feel free to contact me with regard to purchasing paintings or go to my galleries’ websites, which you can link to in the News/Gallery section. Your feedback is always welcome.